Learn how Parents as Teachers and Fathers in Action helped Rickyna and Robert. About a two years ago, Rickyna Miller Smith really needed a friend. She was six months pregnant, had just relocated to Montgomery, and was completely on her own. Though she was receiving prenatal care at River Region Health Center and doing all the things she thought she was supposed to be doing, she couldn’t quite shake the feeling that there was more that she could be doing for herself and the little life growing inside her. Then, one day while at the center, she saw a Gift of Life flyer and asked her social worker what she thought about the program. 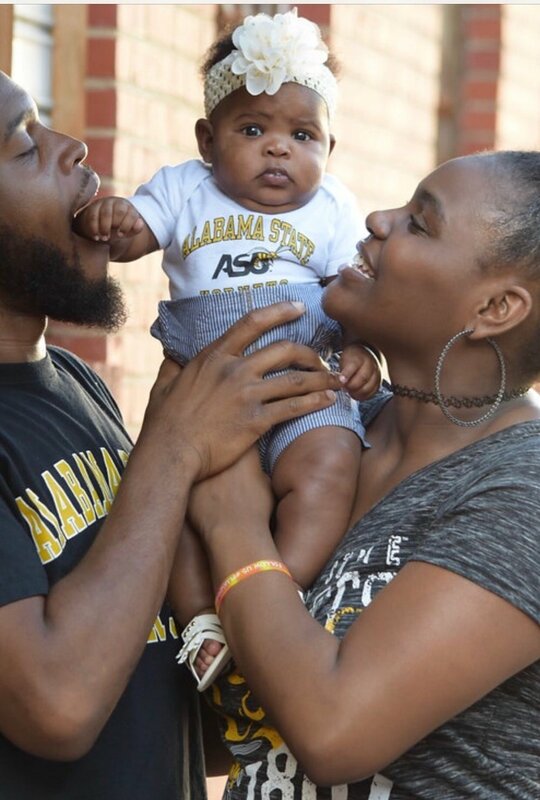 Miller has since completed her undergraduate degree in social work at Alabama State University and is currently pursing graduate studies in forensic social work at ASU. Her goal is to one day help troubled kids or those who have a long history of trauma that have been incarcerated. Miller is currently engaged to Reign’s father, Robert Smith, who was so impressed with what Gift of Life had done for his fiancé, that he enrolled up for GOL’s Fathers in Action Program. Smith also graduated from ASU and is a math teacher at McKee Middle School. Learn more about the Parents as Teacher or Fathers in Action programs, complete the Referral Form, or call (334) 272-1820 or email info@golfound.org if you have any questions.